Over the years, I’ve been blessed with the opportunity to help hundreds of men and women restore their health and heal naturally. Here’s just a few of the testimonials and success stories from clients I’ve worked with that you’ll find truly inspirational. Sherry’s Success Story. Before I started working with Paula, I was a mess! My health was deteriorating, and I was only 43 years young. And, I’m a registered nurse! I suffered severe depression, chronic fatigue, insomnia, allergies, and headaches. My memory was horrible too! I was drinking too much alcohol, taking so many OTC and Rx drugs including antidepressants, Ambien for sleep, antacids for my heartburn, OTC pain medicine, plus other stuff. Nothing was working for me. My decision to work with Paula was the best thing I’ve ever done for myself. She taught me about the importance of quality food, getting daily sunlight, turning my cell phone off at night, the importance of self-care, self-love and forgiveness. I learned how certain situations, relationships and poor choices that I made were affecting my health. On my blood analysis, Paula found that my estrogen was way too high and that the hormones I was taking could be a problem. It was rough at times, but looking back I wouldn’t change a thing. I started feeling better in a few weeks, but really noticed a new, happier me in just 9 months. I feel better than ever thanks to Paula! I don’t take any hormones or medications, and no longer need or want the antidepressants. My skin looks so much better, I’m sleeping, have energy, walk daily, and I lost 23 pounds! Kimberly’s Success Story. After years of working with several naturopathic doctors, internists and endocrinologists, I finally found Paula! She helped me to completely heal my thyroid, fix my adrenals, and reverse Hashimoto’s! Joe’s Success Story. 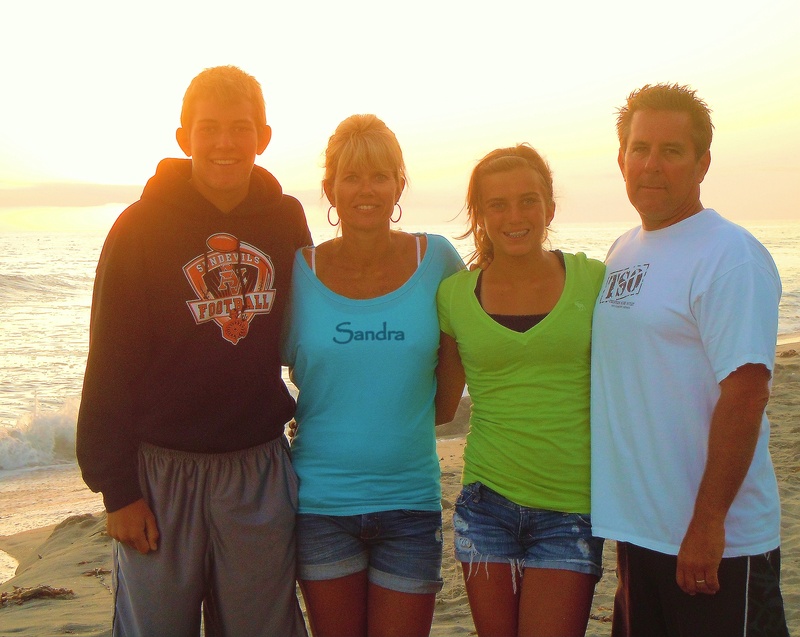 In 2012 at the age of 39, I was diagnosed with rheumatoid arthritis. As a contractor and owner of a busy construction company, this diagnosis along with the debilitating pain and fatigue took a huge impact on my health, my relationships, and my business. I was also experiencing a lot of bloating, heartburn, brain fog, headaches, skin problems, sleepless nights, loose stools, anxiety, sinus infections, and I was depressed, irritable and moody. It was nothing short of a miracle to work with Paula. She found that I had an H. Pylori infection, three bacterial infections, parasites, Candida overgrowth, and tons of vitamin and nutritional deficits. Even though I thought I was eating healthy, Paula explained how certain foods like dairy products, wheat and gluten were making my joint and muscle pain worse. She taught me what foods were best for me, plus so much other helpful advice for my home and life. In just 4 weeks, my life turned around. I was back at work managing my business and working in the field (something I hadn’t been able to do in years). My doctors are astonished, and want to know what I did! I no longer get prednisone shots, and don’t take any over-the-counter or prescription drugs. I have more energy than ever, and I’ve lost weight too! I feel like a new man, and am forever thankful for Paula and everything she has done to help me. Sandra’s Success Story. I am so thankful for Paula, her program and the time she took to help me. As an active, athletic 46-year old Mom, wife and business owner, I suffered tremendous pain and was unable to move for nearly 8 months. After endless visits to over a dozen different doctors and specialists, I reached out to Paula. Jeanne’s Success Story. 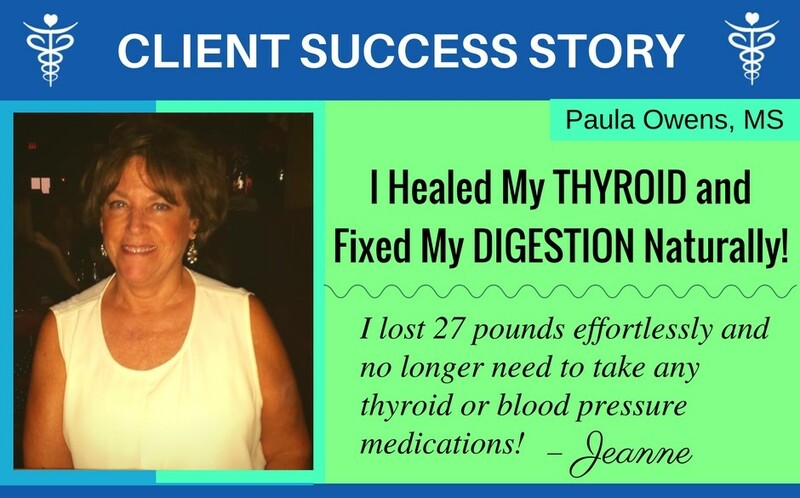 After just 4 months of working with Paula, I lost a total of 27 pounds effortlessly, my thyroid is balanced, my blood pressure is normal, and no longer need to take thyroid and blood pressure medications! Brenda’s Success Story. I was diagnosed with H. Pylori and was going to start taking doctor-prescribed medication when I decided to give Paula a call. Not only did she treat the H. Pylori infection successfully, but she also designed a comprehensive nutrition and lifestyle program for me. I am so grateful to be sleeping through the night now, and I no longer experience constipation, terrible mood swings or anxiety. I am 15 pounds lighter, acne-free, have tons of energy, and have learned the power of proper nutrition and hydration. Paula knows her stuff: she is the real deal! In a world of quick fixes and just plain bad information, Paula’s extensive knowledge, no-nonsense approach and expertise are a breath of fresh air. Colleen’s Testimonial. In 2013, I was losing massive amounts of hair, was always tired and fatigued, and wasn’t my upbeat self. Intuitively, I knew something was off. I started seeking the expert guidance from a nutritionist, and had heard of Paula Owens and the remarkable transformations my friends and business colleagues accomplished from working with her. Paula tested both blood and stool to see what was going on with my heath, my digestion, thyroid, hormones, and what deficiencies I could possibly have. My test results found several nutrient deficiencies, Candida parapsilosis and two other problematic infections, my immune system was on overdrive, and my bowel was leaky, inflamed and irritated. Within a matter of months on Paula’s program, my energy returned, I was getting a good night’s sleep, lost weight, my hair wasn’t falling out anymore, my mood was happier, and I felt better than I had in years! Thank you Paula! Andreana’s Success Story. Three years ago, I hit rock bottom. In my search for answers, I found Paula! I had tried many holistic avenues during my life for nagging stomach issues, stress and depression, and never felt any better or saw any progress or change. In just a matter of weeks on Paula’s program, my results were nothing short of amazing. My blood sugar and A1c decreased, my digestive problems disappeared, the despair lifted, and my mind became focused and alert. My body feels and looks so much healthier, and my mood is significantly happier, more stable and peaceful. My changes also included removing toxic people, eating healthier food, and exercising smarter because Paula opened my eyes and gave me the tools to succeed. Words cannot express how grateful I am for the positive influence Paula has made in my life. I am loving life with my clear mind and healthy body. Stephanie’s Testimonial. Paula successfully helped my daughter overcome an eating disorder, severe anxiety and depression, so I was confident that she could help me too. I was literally bleeding to death from huge uterine fibroids, was severely anemic and extremely fatigued. Paula ran blood tests and stool testing on me, and I found out that I had seven GI infections!!! My blood sugar and insulin were both elevated, my adrenals and thyroid weren’t balanced, and I had numerous vitamin and mineral deficiencies. 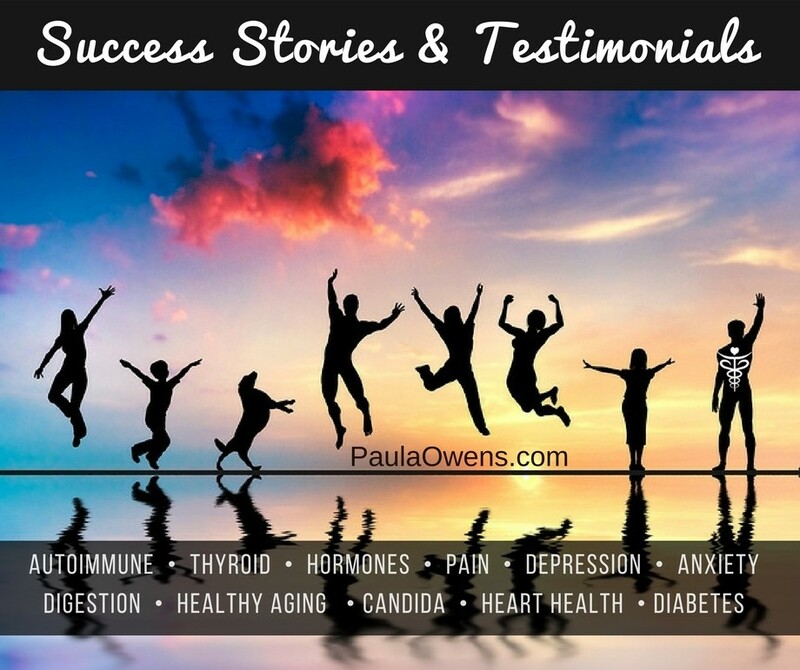 Paula designed a very thorough plan that was personalized to my health issues and helped me get my health back. I felt better in a matter of weeks, and after a few short months my menstrual cycles became normal. I now have tons of energy, a healthy thyroid, no more brain fog or belly bloat, and as a bonus I’ve lost weight and my skin looks fantastic!